Yeap, it was the experience of my life. A very dry sweaty cold run. Travel to Kota Kinabalu (KK) on Friday night and went up to the Kinabalu Park on Saturday afternoon. Since most of the accomodations around and inside Kinabalu are fully booked, I have no choice to book a room at Poring Hot Spring, Ranau Sabah at a price of B$250. At the time when I booked it, I didn’t notice that the distance from Kinabalu Park to Poring Hot Spring is 45km downhill. So, on Saturday after we passed Kinabalu Park, we saw the BIG signboard – Poring Hot Spring – 45km. That's like going to Tutong from Sg Akar. Jauh tuuuu. So we keep on driving, driving , driving downhill slowly because we were following a big trailer. So after 30km, we decided to turn back, take our chances if there is any room available around Kinabalu Park. After 2nd attempt, we managed to get a room. RM30 per night. If we decided to stay at Poring, the problem would be during race day, we have to wake up early around 4:00am, drive 45km uphill to Kinabalu Park which would take around 1 hour and the road is very dark and lots of corners. That is not good - very dangerous. This is what you get for a RM30 per night. A wooden resort with minimal facilities. It was a 5 minutes drive to the Kinabalu Park. I lost B$250 deposits at Poring Resort. Checked in around 3pm and we had a quick nap. At around 5pm, we went to Kinabalu Park to collect our goodie bag and at 6pm – runner’s briefing. The race start at 7am but we have to be here by 5:30am. So early, so very cold and I didn’t bring my jacket. At 6:31am. Everyone is ready. I’m wearing my new calf compression. Very good. Our attire for the run. I decided to wear a glove just to protect my finger not because of the cold. I saw a few runners wear a thick jacket and I saw some runners wearing as if they are running in a hot humid race. The race started around 7am and we have to run 1km uphill on road surface before we reached Timpohon Gate, the main entrance of Kinabalu Mountain. I’ve decided to run at my own pace, controlling my hear rate so that it wouldn’t overshoot to the MAX. When the climbed started, I just walk – fast walk and most of the other runners are doing it also. If you can walk fast, you can easily overtake those runners who do run-walk-rest-recover-run. I reached Pondok Layang Layang, the 4km checkpoint at 8:10am i.e. 1hour 10 minutes after the flagged off and I have 1 hour 20 minutes to reach to the summit. When I registered for this climbathon, my first target was to reach Laban Rata, then the Summit and after that if it is possible finish the race. But after reaching Laban Rata and looking at the time, it would be hard to reach in time – not impossible but hard. I stopped at Laban Rata for a few minutes and went down the mountain. I caught up with my brother along the way. He was also going down after reaching Pondok Layang Layang (his target). Since we crossed the finished line in 4 hours 13 minutes, we were given the finisher medal even though we did not reach the summit. Definitely I will come again. Next time I will push my self to reach to the summit. After a few days, only my calf hurts but not that much. My training really paid off. I’ve done it, when are you guys going to do it…...??? sounds really cool, lah. I wanted to join this year but terribly swamped with work. will definitely sign up and go next year. how do train, bro? And congrats for finishing strong! zul: engko pun bulih buat. kalau ironman n ultra u bulih buat, naik gunung ni kira makan angin sejuk saja. amsyah: training is easy. banyakkan naik bukit - running uphill for few hours. 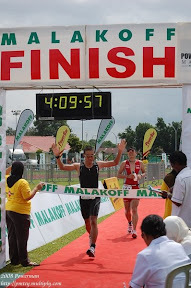 are you joining kk climbathon this year?Iam joining and looking for people to train in brunei. let me know if you are interested in training and going there together. you can email me at coachjohanbrunei@gmail.com! thanks for the report and for your website! very useful in brunei! I'm sorry I'm not joining this year KK Climbathon.